To facilitate even more the navigation on www.tme.eu website, we have introduced another improvement. 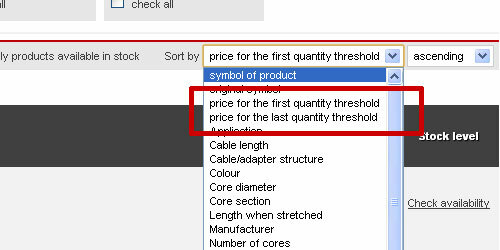 Before, customers could only sort search results in the catalogue, now, with the new option, it is possible to sort products by their prices. Having introduced this improvement, now it is possible to sort a selected group of products according to prices for the first and the last quantitative threshold. Thanks to this option, Customers will be able to quickly find needed products in the expected price. Note! Sorting applies to prices which are not subject to individual discounts.